I’ve said for years that dividend-happy real estate investment trusts (REITs) are the superior play for long-term wealth generation. And yet another set of data – this one spanning more than half a century – proves just how powerful the REIT space really is. Let me show you the latest findings – and introduce you to a handful of stocks that should deliver market-beating returns for the next several decades. A couple months ago, I highlighted a CEM Benchmarking study of asset-class returns going back to 1998 that showed publicly listed REITs trounced everything in retirement-focused accounts: large-cap stocks, small-cap stocks, bonds, private equity, hedge funds – you name it! Here’s another piece of research that goes much further back – 55 years, to be precise – and tells an even more convincing story of REIT dominance. “Historical Returns of the Market Portfolio,” released by a trio of researchers in November 2017, studied asset classes worldwide from all the way back to 1960 through 2015 and found that REITs delivered nearly a full percentage point more in returns annually than global stocks. 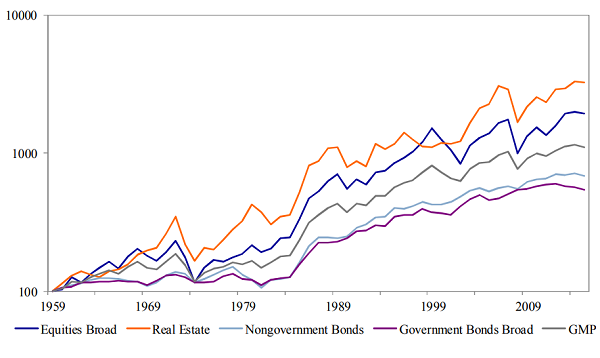 Specifically, REITs delivers a compound annual return of 6.43% per year (adjusted for inflation), beating stocks (5.45%), non-government bonds (3.5%) and government bonds (3.06%). That outperformance occurred across various economic situations – inflation, recessions, bull and bear markets. There’s no secret: Real estate delivers steady growth over time, not to mention the compounding power of stable and typically growing dividends. But who will carry the torch for REITs over the next 55 years? It takes a special level of company to fit the bill. These three REITs have what it takes. One key to finding a stock that will survive – and better still, thrive – over the long-term is buying into a business that likely won’t get disrupted overnight. American Tower is a telecommunications infrastructure REIT that boasts a global portfolio of 170,000 cellular towers – that it leases out to the likes of AT&T (T) and Verizon (VZ) – as well as outdoor antenna systems, managed rooftops and other solutions across 17 countries on five continents. In short, then, American Tower is involved in what’s essentially a utility at this point (mobile communication), via a delivery method that’s showing no signs of evolving from the current tower structure. Indeed, the “next generation” – 5G, which will only begin to roll out in 2019 – will be distributed in much the same way as its predecessors. Mobile communications are becoming the lifeblood of the world’s citizens. Not only is this now the primary way humans communicate, but it’s becoming the way we all learn, research, ingest news … and even shop. In fact, I recently extolled American Tower’s virtues as a “hidden” way to dredge dividends out of Amazon.com (AMZN). Those dividends aren’t exactly robust at current prices, mind you, but for all the right reasons. That is, American Tower has grown its dividend like a weed, at 172% over the past five years alone, but its soaring stock price weighs on the current listed yield. 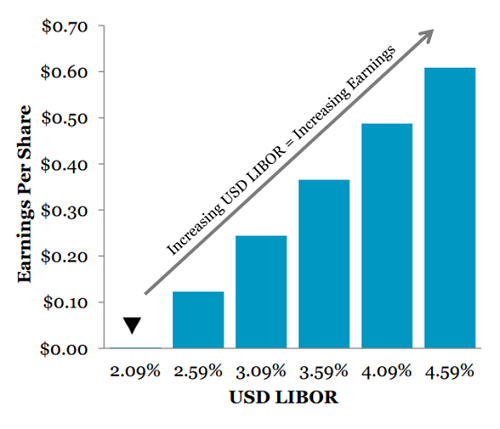 Longtime holders will continue to enjoy much better percentages as the years roll on. Another market that isn’t going away is housing. Oh, housing will ebb and flow – 2007-08 was a stark reminder of that – but as long as there are humans, they’ll always need a roof over their head. And especially as space becomes increasingly limited, apartments will reign supreme. That’s good news for the likes of AvalonBay Communities (AVB). AvalonBay is one of the largest publicly traded residential REITs, representing 84,490 homes in 290 communities across 11 outstanding housing markets that span much the East Coast, Pacific Northwest and California. It does so via the Avalon, AVA and “eaves by Avalon” brands. This isn’t a turbulence-free market by any means. Rent growth has been dipping from 5%-plus year-over-year in recent years to roughly 2%, though that number is finally stabilizing. AvalonBay has actually reduced its development starts volume from a $1.4 billion annual average from 2013-16 to a projected $900 million average across 2017-18. Still, Avalon’s future looks bright, even in this uneasy short-term. The company revised its full-year 2018 outlook a few months ago, including 4.1% growth in funds from operations (FFO, an important metric of REIT profitability), up from 3.6% initially projected, 2.4% same-store rental revenue growth (up from 2.1%) and 2.3% net operating income growth (up from 2%). This will never be a monster-growth business. 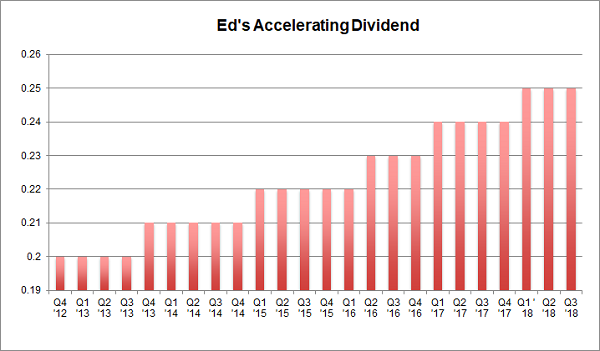 But it should head broadly higher over time, helping keep up a dividend-payout streak that dates back to 1995. Something else that isn’t going away tomorrow, next year or decades from now? Industry. It is going to change. Industry has been in a long-term trend of automation for literally decades now, moving from man to man-assisted machine to fully self-reliant robots. If you want an example of what the future might look like, consider this CNBC profile of the world’s first humanless warehouse. But one thing that hasn’t changed about the warehouse is that it takes up space. Thus, barring some bizarre change in the rules of physics, industrial landlords such as First Industrial Realty Trust (FR) will always be in demand. First Industrial is a wide-ranging industrial REIT that leases out properties such as national and regional distribution centers (read: warehouses), light industrial buildings (for product assembly) and R&D facilities, and also deals in developable land. Also, like other industrial REITs, FR does more than just lease out – it offers property management services, and can even build to suit or redevelop existing properties to better serve an individual customer’s needs. FR is a steady Eddie that keeps growing over time. Its most recent quarterly report was a gem, with cash rental rates up 9% year-over-year, fueling 6.8% growth in cash same-store NOI. Occupancy was 97.6%, up from 96.8% just a quarter ago – and up from 92.9% in 2013. I recently pointed out that REITs such as Prologis (PLD) are a play on the growth of e-commerce, and First Industrial is in the same ilk. Retailers are shifting away from brick-and-mortar space in malls and instead are selling more wares online. All of those goods have to come from somewhere, and that somewhere distribution centers – currently 84% of FR’s square footage. My two favorite REITs today are comfortably positioned in the exact same kinds of recession-proof industries that should breed success not for years, but decades. They’ll have no problem continuing to raise their rents – and reward their shareholders – no matter what the Fed decides at its next meeting, what President Trump tweets or when the stock market finally takes a breather. Management then collects the monthly payments, deposits the checks, and then it sends most of the profits our way as dividends (a legal requirement to have REIT status). This firm is a conservative lender with perfect loan performance (100%). Its growing portfolio will drive higher profits, which in turn will inspire the next dividend hike. The best time to buy the stock is right now, while it makes the investments which will drive its payout and share price higher from here. Same for another REIT favorite of mine, a 6.9% payer backed by an unstoppable demographic trend that will deliver growing dividends for the next 30 years. Interest rates are no problem for this landlord because it will simply continue raising the rents on its “must have” facilities. Well, his dream and plan were plenty – the visionary entrepreneur parlayed them into $7+ billion in assets! 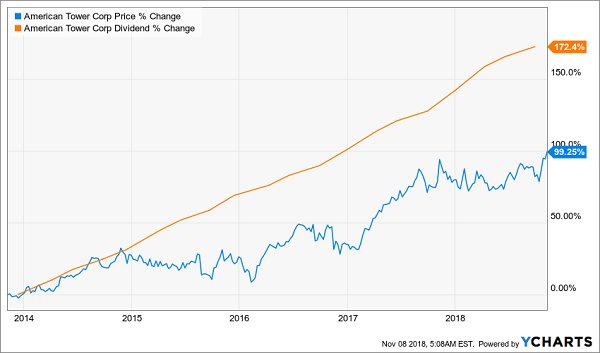 I love dividend increases because they are proof that management is actually making more money, so it can afford to pay us shareholders more. And an accelerating payout is a flat-out cry for help! 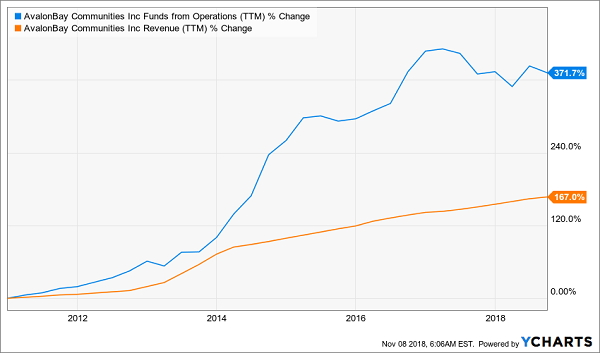 Meanwhile, investors and money managers who spot dividend accelerators lose their minds because, in theory, there is no valuation too high for a company that is increasing its dividend at an accelerating rate. Their spreadsheets literally break, and they buy the stock in a frenzy (after we already own it, of course). It yields a fat (and secure) 6.9%. These two REITs are both “best buys” in my 8% No Withdrawal Portfolio – an 8% dividend paying portfolio that lets retirees live on secure payouts alone. Now, as active recommendations for my premium subscribers, it wouldn’t be fair to reveal their names here. But I would like to send you a free copy of my latest special report, Recession Proof REITs: 2 Plays With 7%+ Yields and 25% Upside, with all the details. In short, it’s everything you need to know before you invest a single penny, and it’s yours at no cost whatsoever. Click here and I’ll share how you can get a complimentary copy of my premium REIT research.